Today was the annual Turkey Trot. The YMCA and Vic decided this year to move it from the traditional spot at the library and have it at James Monroe High School instead. I've been against the move from the beginning, and this week previewing the course did nothing to lessen my dislike of the changes. With the old course, we did a lollipop from the library, down Caroline, around Normandy Village, and back, finishing on Sophia Street right behind the library. The old course was flat, fast, and well-spectated by the remaining thousand people who were yet to reach mile 1 as I was passing mile 2 headed for home. Vanity aside, having hundreds of those people cheering your name carried you along that third mile, leaving you with only a quarter of a mile of solitude to really struggle before rounding Pitt Street and heading for home. The new course was nothing like that. For anyone who reads this that didn't run the race, aka no one, here is a map from USATF. Aside from my complaint about the crowd support from fellow "runners," this course is boring! 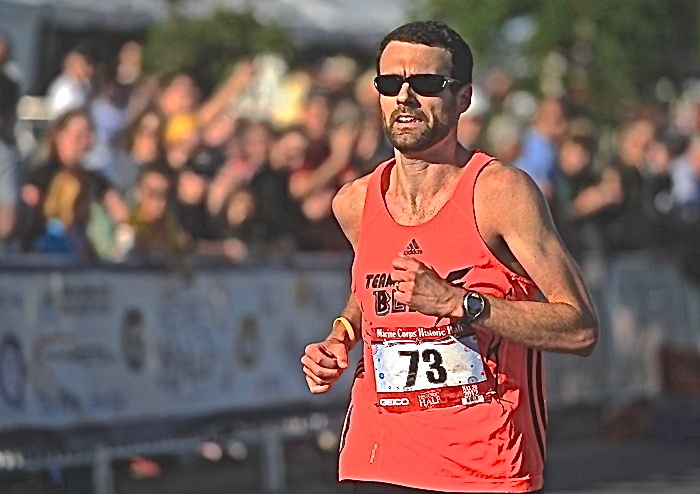 Of the 13 races that I run in Fredericksburg during the year, over half of them are run on some combination of Sunken and Little Page: John Robbins 8k, J Brian's 15k, MCM Historic Half Marathon, Heritage Festival 5mi, Mental Health 5k, this Turkey Trot, and the Blue & Gray Half-Marathon. Take out the Historic Half, and that's half of the Coldwell Banker Elite Grand Prix Series... We should rename it the "Below the College Grand Prix Series!" So we've got 1) no crowd support, 2) no course variety in the series so far. There are also 14 turns on this new course compared to 6 on the old course. We actually started with a turn 50 meters into the race and finished the same way! I was on the starting line and got slammed into by the crowd behind me and then had to sprint to get out of the gate before the corner. I realize that this year they used timing mats at the starting line (new for Vic with FARC races) and that the width of the mats were restricted by price, but it was still VERY narrow. I could sit here complaining all day, but I've already said all this crap out-loud. Onto the race. It was a nice day. Cloudy, cool. Maybe low 40's. The rain was holding off. It was just cold enough to need gloves, and my feet were a little chilly with no socks in the T4s. I was on the starting line with the other "VIP," Tim, Guy Alton, 4-6 foreign guys and girls, and Katherine Walker, decked out in her UVA gear. You can see her Facebook photo tagged here. About 30 seconds before the gun, they let the rope go behind us and we were pushed up to the edge of the mats by a bunch of kids who didn't belong there, as well as a few who did. The gun went off and we were out. I was fighting for space and saying to anyone who would listen to watch out for the corner. We rounded it and I was surrounded. I moved around a couple of guys to find some space and then was alone. The front group was clear and I wanted nothing to do with it. It had 4 foreigners, Tim, Guy, Joey Murray, and some other guy I didn't know. I was alone behind them, but I knew that Rich Saunders was lurking. I went out fast, and tried to slow it down before we got to the hill on Washington Avenue so that I wouldn't use too much energy there. The pack was running in the middle of the road but I went for the right side for some reason. I tried to focus on myself and let them go, but I was too interested in seeing what happened up there. Idiot. Despite the fact that this was the one point on the course that you could see other runners, coming down the hill on Cornell to turn left onto Kenmore, he had to ask me which way to go. Obviously we had only one choice. I tried to regain on him but it was no use. I fought my way down Kenmore, unsure of where to run on the street. Meanwhile I could hear footsteps coming. At the end of Mary Ball, I could feel him, and grey shirt had seemingly won. I told Rich to "go get him,"and he said good job to me. But somehow I wasn't dropped. Heading back on Washington, against the one-way road traffic which felt so unnatural to oppose, I remained in contact with them. As we approached the third mile, I passed grey shirt. It was the first time, but the last time I'd have to. I ran 5:21 for the last mile, but I don't remember looking at it at the time. I started to get some cheers as the spectators were lining the last few blocks leading to the JM parking lot. I was closing on Rich too, and could almost reach out to touch him as we turned that one corner into the JM parking lot. I saw the clock slipping away, clicking over 16:00 and Rich pulled away with one last gear. But I didn't give up at the end and I was just under in 16:08. Pretty good for not wanting much more than 16:30. A poorly executed race, with no real plan. Go out fast and hang on for dear life. But I finished without dying and I didn't even throw up at the end. KC and my mom were there at the finish, I talked to them and grabbed my shirt to find Anne, David and Chip. I missed Chip finish first, but ran in with Anne & David a little bit, as well as the Axlerods. Chip came back to find me, I stopped to talk to his parents for a while, and then went off to get food and cool down. Grey shirt turned out to be a bandit. He didn't finish the race, so I essentially out-kicked a ghost. I was 9th place, 66 seconds ahead of 10th place. I won my age group because they went top-5 overall, and 6-8 were all younger than I was. Joey Murray finally beat me, and decisively, running 15:29. I would have liked to have been there with him, but I wasn't going to go out any faster than I did. I thought when I saw him in front me at 400 meters "He's either brave and in great shape, crazy, or both." I guess it was both. Onward to Blue & Gray. I doubt that my 30-40 miles a week and zero workouts will translate well to a half-marathon, but they worked out fairly well today so we'll see. I'll try to post more, Tim. So that way you have something to do in Michigan when you're not running.